Every Sunday after home Griz Football games, the Sunday Sweepers clean up any trash in street surrounding UM that was left over from the day before. 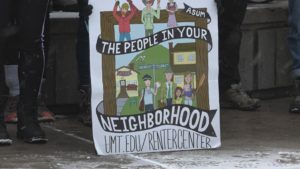 This program is run by ASUM’s Renter Center on Campus. It’s goal is to bridge the divide between students and the community by picking up garbage and asking residents if they have encountered any issues like noise complaints or vandalism. Reporter Mederios Whitworth-Babb went to campus to find out how ASUM is making sure Missoula’s streets are clean and neighbors are happy.